I have always felt that I lived a charmed life. However, in the Fall 2010, I learned that I was “honored” to have a flail mitral valve posterior leaflet, a leaky valve. At that time former exchange student, Chris, also one of the boys that calls me “Dad,” told me that I better have a metallurgist as a surgeon for the mitral valve repair because I have a heart of gold. That statement melted my heart. Early on when I became an endurance athlete at age 62, I realized that my general family doctor who discovered my hypertension wasn’t knowledgeable regarding managing these conditions in an athlete. This led me to find Brendan Cavanaugh who has now taken outstanding care of me for eleven years. There are MDs that specialize in sports medicine. Sports medicine is a specialization because it is unique. If one is an athlete, I really believe one should, as much as possible, receive health care from providers that understand the unique needs of an athlete. Also, it is important that provider keeps up-to-date regarding the latest science in his/her specialization field. A few days later after receiving this life changing news I was saying, “Who Moved My Cheese?” I had read the book by Spencer Johnson, but I wasn’t ready for my own cheese. That cheese had to be moved. Perhaps it was not so much that I wasn’t ready, but more that I didn’t expect this diagnosis, didn’t anticipate this challenge, and just didn’t want to have such a thing to interfere with my athletic life. I just didn’t want to have to deal with it. But, yes, I was ready and somehow had learned that things are what they are. One deals, manages what needs to be done, and finds out the best way to cope. Rewind thirteen years to the beginning of the Iraq invasion in early 2003. The death of reporter, David Bloom got my attention. He died because of blood clots in his legs. I had been having pain in my legs for a long time and decided that I should get them checked out. The good news was that I had no blood clots, but I was diagnosed with hypertension. I was also a bit pudgy … well more than a little pudgy. Doc Thompson actually said “if you don’t do something about your weight and start to exercise you are going to blow a gasket.” Yeah, that got my attention! It is often been said that life begins at 40. For me, 60 was the beginning of a new life. At Doc Thompson’s recommendation, I began a low carbohydrate diet and exercise. The exercise evolved into low exertion range aerobic exercising mostly low heart rate level swimming in 2003 to lose weight and help manage hypertension. I eventually went from 225 lbs to my goal weight of 161 lbs. I was taken off of hypertension management medications. Early in 2005, I decided to try running again. In the past, I had tried to start running, but each time after a week or two, I would quit. In early February 2005, I made a deal with myself that if I would faithfully run every day for 21 days, then I would find a running group. I succeeded and joined a local beginners group called “Women and Men in Motion.” That group helped me to achieve a 5K distance. I had never in my life run a 5k and had no idea that I was capable of it. I graduated from that group and found Albuquerque Fit. ABQ Fit offered different goal distances, and I was inspired when I saw Marathon as a goal choice. I thought, “why not go for it?” and began to train with them for the impossible, which was training for the Duke City Marathon. One of my favorite songs is “The Impossible Dream” which I admit to singing out loud. I completed my first 10 K run ever on my 62nd birthday in April along with a Half Marathon on Memorial Day, which were few weeks before the groups scheduled 13-mile long run. I did this without the coach’s knowledge. As a side note, this would be a “red flag” regarding a particular personality trait that a good coach may or not recognize regarding an athlete who can be prone to overuse injury. On Labor Day weekend I again, without the knowledge of my coach, completed the New Mexico Marathon in just over 6 hours. I just had to do the full Marathon distance on my own without telling anyone to prove to myself that I could do it before doing it with the group. This was another red flag. Six days later my group had an 18-mile run during which I injured myself from overuse. This is when I learned that there could be such a thing as muscle overuse injury. This was another clue to a personality trait that a good coach or trainer may or may not be able to recognize, but one that is actually very important when coaching or training athletics. When my coach found out about the Marathon, he told me that I had S.R.S., Stupid Runners Syndrome. I then had PT through December, and I was not allowed to run the October Marathon with my group. When I was released from PT, I wanted to expand my endurance and learned about Triathlon from my youngest daughter. In that support program, I completed the Capital of Texas Olympic distance. While I finished it, I couldn’t understand why during the run my vision was like an over exposed black and white photograph. I was confused so I ran in the shade and walked in the sun. I drank a lot of water and Gatorade. At the end, I walked around just a little light-headed and passed out for an instant when I bent over to unpack my bike from the rack in the transition area. Later, back at home I “fired” the cardiologist who ignored my questions about HCTZ, the diuretic the cardiologist had prescribed for my hypertension. On August 28, 2010 I was attempting the Vermont Journey Half Ironman Triathlon and within about a hundred or so yards from finishing the 1.2-mile swim, I was having trouble breathing. I kept positive with can do self-talk and told myself to go easy and be smart. As I was struggling, I thought about my Belgian-Moroccan son, Ayoub. The night before I received a call from Ayoub asking how I was doing. I told Ayoub that I had done all the individual distances, even practicing at the event site, that I was a little scared and a lot intimidated. Wise Ayoub, and Olympic quality elite runner, told me that being intimidated gives one more appreciation for the event. Then he said to just be smart, and I would do just fine. Even with my positive thoughts, I sank deeper and deeper in the water as I went forward. I even turned on my back for a bit to catch my breath, which didn’t help. When I turned back over to swim on my stomach, I was deeper in the water than before and struggled for air. I waived my arm into the air for the kayak for aid. It reached me right before I completely sank into the water. The safety monitors had been watching me, the very last swimmer in the water. I turned in my chip and gathered my bike and gear from the transition area. I drove back to motel disappointed. I had labored breathing for several hours. I tried to figure out what went wrong there but there were too many variables such as a tooth infection, the antibiotics I’d just finished, the warm day with the feeling of sun through my wet suit, and possible hydration. As I was packing my bike at the motel, I felt dizziness. I took my blood pressure, and it was really, really low. Hypotension is not unusual for me if I get too dehydrated. I recalled when I did the Duke City Marathon at mile 9 things just were not right. At that time, I rationalized that I had not trained enough. Also, I had the stupid idea that I shouldn’t bother Dr. Cavanaugh, my cardiologist, with anything until my regular six-month follow-up appointment. In the past I had called for Dr. Cavanaugh if something seemed a little out of the ordinary, such as at the incident at end of June 2008. 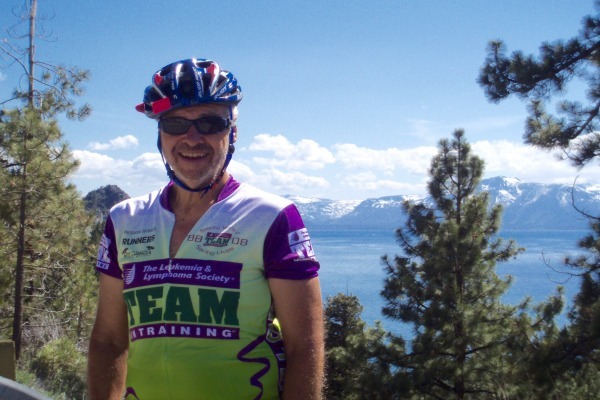 At that time, I had very, very slight sensation in my left chest area every time I pushed down on my bicycle peddle while going over Spooner Pass at Lake Tahoe on a Century bike ride. I had forgotten about it, but a week or two later I had the same sensation peddling on a hill near my home in the mountains east of Albuquerque. I then called Dr. Cavanaugh’s nurse and asked if it was something they would want to know about. I immediately had an appointment. Doc said, “I could give you another stress test, but you athletes can mask the results.” I was flattered to be called an athlete. This is an important point, an important lesson as athletes can mask cardiac symptoms. “We know you have plaque in your arteries, but we don’t know how much. The only way we can know for sure is to do an angiogram,” my doctor said. This was done a couple days later. Several partially blocked coronary arteries were opened with angioplasties and a stent was placed in a branch artery. Wow! A guy can have kind of a serious heart issue and hardly have a clue. On a pain scale from 1 to 10 with 1 being low, my left chest sensation would register maybe as much as .5. This means that I was experiencing minimal discomfort, not really even a pain. A nothing. That year, in June 2008, I got a stent and by mid-September proudly proved to Team In Training Coach Phil Baca that a little heart stent doesn’t have to stop a guy from doing the Team In Training Nations Triathlon. As for the heart valve job described at the very beginning of this story, I went to Cleveland Clinic for the valve job on mitral valve repair on March 11, 2010. .I had the best heart surgeons on the planet with the assistance of a DaVinci Robot. I have almost no scar and a few puncture wound points under my right arm. Did that valve job event stop me from continuing with endurance athletics? No way! Between discovering that I needed open-heart surgery and having the surgery, I made my cardiac rehab goal to complete another Marathon. I asked my four daughters if they would like to do it with me, and we all immediately started training. Only my youngest had even before done a Half Marathon. About five weeks after the open-heart surgery, I did my annual mid-April annual birthday present to myself, the Tri of the Rim, at Ft Lewis College in Durango. Ayoub went with my wife and me. After the event, I was so touched when Ayoub said, “You inspire me.” Wow! Ayoub is a strong, elite athlete; and I inspire him! I did a practice with a Half Marathon in mid-August because my four daughters were training to do a Half Marathon, Chips and Salsa, with me in mid-September. I was so proud of them. Running with those girls, Melony, Mimi, and Monique was wonderful. I finished 3rd in my age group, and Monique beat me. I did go on to complete my cardiac rehabilitation goal, the Marine Corps Marathon, on Oct 30th, 2011, which was seven and a half months after my open-heart surgery. Although I am very proud of this, I will not tell about it without mentioning that I am also very humbled by Ellen Charnley. She is the author of Living Life to the Full, and Ironheart Founding Board Member, and one of my cardiac athlete Facebook friends. Ellen is another special hero as she completed IronMan Arizona eight months after her open-heart surgery. This was one year before my heart surgery by the same doc and team at the Cleveland Clinic Foundation. As of this writing, I have just finished working as an intern at the Cardiac Rehabilitation Center at the University of New Mexico Hospital. In May 2016, I received a Master of Science Degree in Exercise Science, aka Exercise Physiology. While taking a series of graduate courses on disabilities, intellectual, learning, and physical disabilities, I found myself reading about myself as I learned about Asperger’s Syndrome. I am now formally diagnosed, DSM 5 coding 299.0 (F84.0), which is basically autism without an intellectual disability. With my newfound knowledge of my Asperger’s Syndrome diagnosis, there are lessons in my story for coaches. My tendency to hurt myself is stealth, and this is the case with many in this high functioning autism group of people. You cannot tell by looking at some in most cases. I mentioned several times that coaches might not pick up on a personality trait where an athlete can be prone to such as overuse in injury, and this is important to note. I am excited about entering a new career field. This career change will allow me to attempt a couple of things on my bucket list before I get too old. I turned 73 in April 2016. I want to do the road cycle trip from Pacific to Atlantic across the USA. I also want to ride my motorcycle across Canada west to east, which means riding additionally from Albuquerque to Vancouver, BC, onto Prince Edward Island with some side trips on the way, and then to Maine and then back to Albuquerque. In her book, Ellen Charnley wrote about Living Life to the Full. Hic-ups in life such as a cardiac issue does not automatically make one a cardiac cripple. Hero Mike said to me “attitude is everything” and, you know, Mike is right-on. Wise Ayoub doing the Half Ironman advised me to “be smart.” I say those two statements because “attitude is everything” and “be smart” are just two of many word phrases that describe how to really live life to the full. I look forward to continue doing just that, living life to the full. Life is good. I have lived a charmed life.